Pizza always adds to the party! In the photo above, Jennifer Turner of Modern Makeup in Toronto relaxes on an upscale Toronto condo balcony in Parkdale with a slice of deluxe pizza from Amico’s. Every weeknight (except Tuesday) and all weekend long, Amico’s Pizza’s delivery people rush our menu of real Italian pizzas and pastas to busy houses and apartments all over Parkdale and beyond. Hungry people call us or order online when they need healthy food at affordable prices. When delivered, our meals become part of the celebration and add to the cultural attraction. Such was the case on Saturday 09 June 2018 when Randolf, our delivery person that day, was called to a luxury condo overlooking Lamport Stadium. Premier Matrix Realty helped CanEggs Ltd make media that day, donating the unique photography space and buying the afternoon meal. 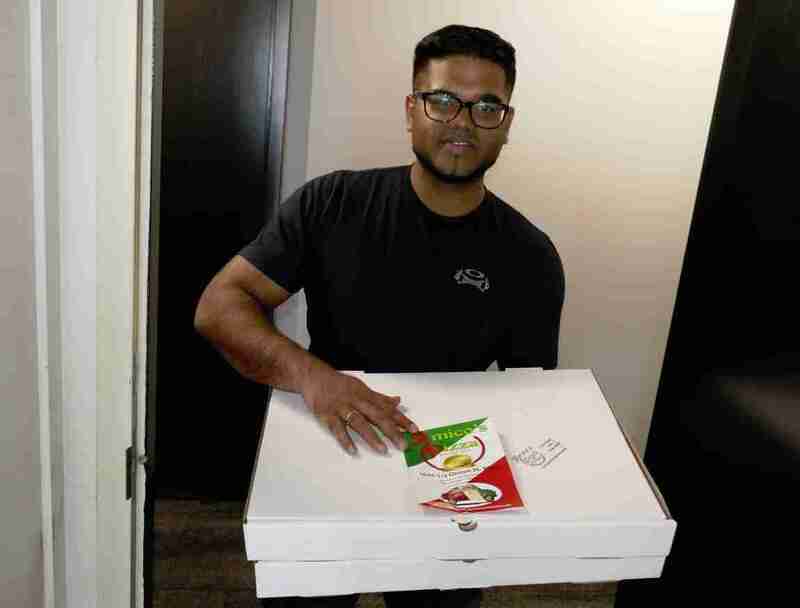 Randolf delivered two large pizzas in boxes and three bags containing two different salads and an aluminum crisper filled with spicy chicken wings; a fourth cake box contained napkins, cutlery and dips. It was a large order, and contained enough food to feed a couple dozen people. But something was missing – the drinks. This crew didn’t order beverages from us because they were busy blending real fruit smoothies for themselves and for the internet. While Randolf watched they made up another jug to accompany the dinner we delivered that day. The ladies in the condo were hungry and real happy that Randolf showed up on time with solid food. They were waiting for the meal to be sure. Most had been there since ten in the morning working non stop styling food and faces for photography. 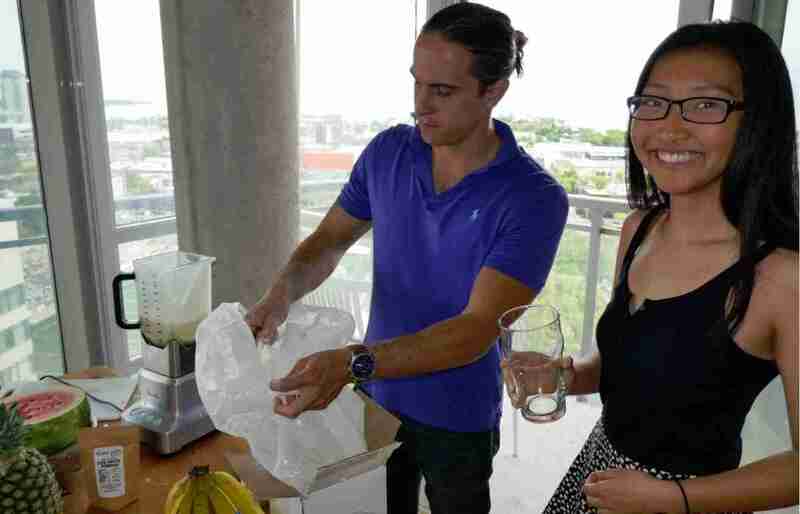 These female models and makeup artists were working hard making face masks (for health and beauty – skin rejuvenation) and blending and photographing fruit smoothies containing egg white powder from Caneggs in Toronto. Each real fruit blend was brought to frothy perfection by adding 38 grams, or one heaping scoop of the powder per liter. Tamara the media producer was absolutely loving Amico’s black olive in gooey mozzarella cheese pizza. For her it was stress medicine; she needed the comfort food to relax and reset her mind. Tamarra’s job is to test recipes and get photos of food creations and then write detailed descriptions of all the concoctions she made for the new product. 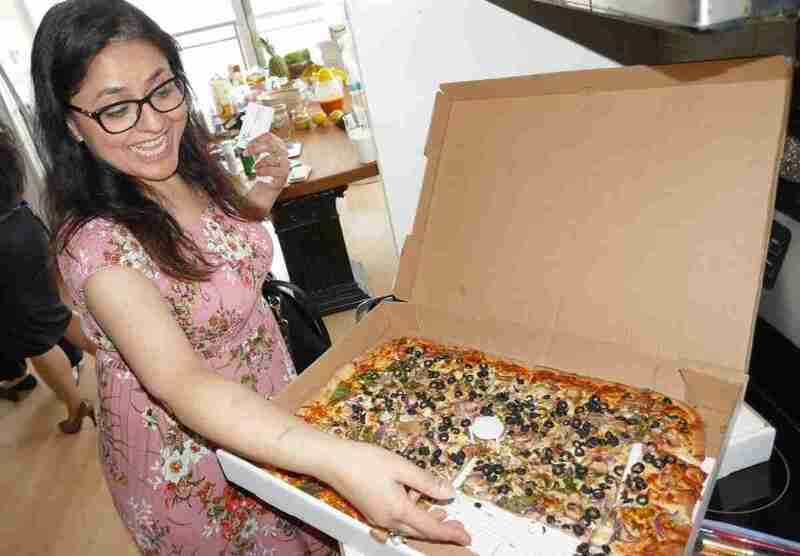 This pizza hit the spot and nourished her creative spirit. But what really made that Saturday so special was what was happening outside the condominium. 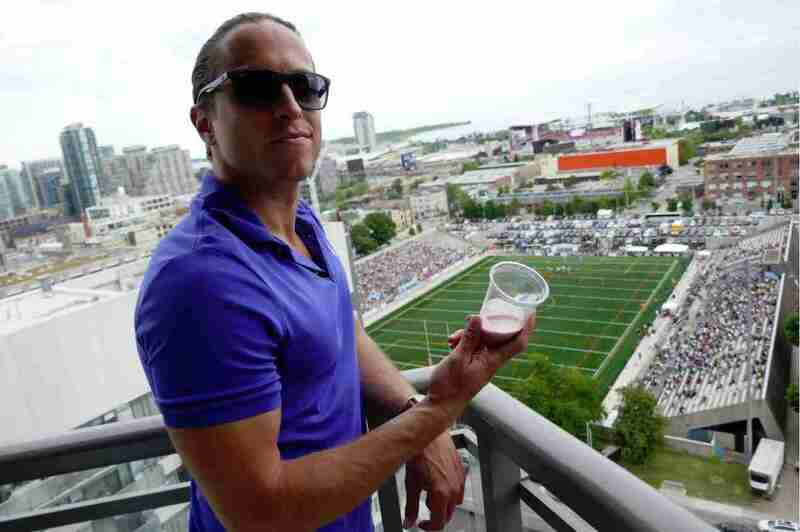 The apartment had an incredible view of the lake and down below, in Lamport Stadium, over seven thousand rugby fans were gathered to watch the Toronto Wolfpack home opener. Our team was taking on the London Broncos and the view from balcony was exquisite. On Saturday 09 June 2018 at 4:30 pm Toronto’s transatlantic rugby league team celebrated its return to Lamport Stadium in style with a 32-12 victory over the London Broncos, extending its winning streak to twelve games straight in league play. CBC Sports broadcast the game live all over Canada. Jason Lau from eMagTO visited the studio space while writing about the rugby game and included pictures from the balcony in his reporting. Life above the crowds is sometimes more pleasant that being down in the bleachers, suffering a more immersive first-hand rugby fan experience. These ladies were expecting gourmet pizzas, and so they were doubly thrilled to see the heaping salads that were included in the order. The vegetarian offerings were the first dishes to be devoured out on the balcony. Amico’s Pizza also sent along a box filled with paper napkins, pizza dips and salad dressings and plastic cutlery. They set up out on the balcony where Velago Patio Furniture had donated an outdoor sofa and chairs. The ladies had everything the needed to relax and watch the game. Alice Li, seen above on the left peeking into the cutlery box is 2017 Miss Ontario World, and while holding this title she’s careful to eat right and stay in shape for the summer’s competitions. Beside her is Christina Paruag, the editor of FemEvolve magazine who not only eats nutritious food, but writes and photographs health and wellness fare for her publication. Any restaurant in Toronto would have to work hard to win these ladies’ respect, and so it pleased us greatly to learn how much they loved their meal.